English Biblical and Hebraic scholar; born about 1711; died at Arundel Jan. 20, 1771. He was educated at St. John's College, Cambridge, where he received his master's degree in 1740. He took unusual interest in Old Testament studies, and entered with zest into controversy with Bishop Warburton on his "Divine Legation of Moses," and with Kennicott on the variœ lectiones of the Hebrew text that the latter had published. 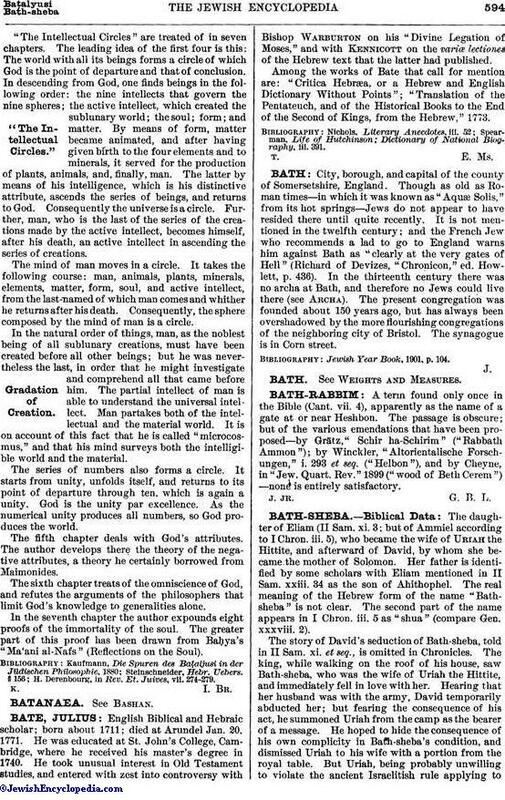 Among the works of Bate that call for mention are: "Critica Hebræa, or a Hebrew and English Dictionary Without Points"; "Translation of the Pentateuch, and of the Historical Books to the End of the Second of Kings, from the Hebrew," 1773. Spearman, Life of Hutchinson; Dictionary of National Biography, iii. 391.